At a garden party on a sunny afternoon, Alice is surprised to see her parents’ friend Lewis Carroll transform into a white rabbit. When she follows him down a rabbit hole events become curiouser and curiouser… As Alice journeys through Wonderland, she encounters countless strange creatures. She’s swept off her feet by the charming Knave of Hearts, who’s on the run for stealing the tarts. Confusion piles upon confusion. Then Alice wakes with a start. Was it all a daydream? 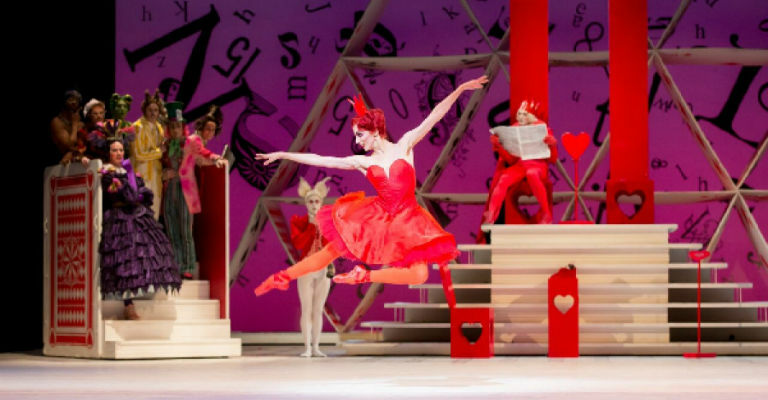 Alice encounters a cast of extraordinary and instantly recognizable characters, from the highly strung Queen of Hearts – who performs a hilarious send-up of The Sleeping Beauty’s famous Rose Adage – to a playing-card corps de ballet, a sinuous caterpillar and a tap-dancing Mad Hatter. But the ballet does not avoid the darker undercurrents of Lewis Carroll’s story: a nightmarish kitchen, an eerily disembodied Cheshire Cat and the unhinged tea party are all here in vivid detail. The delicious result shows The Royal Ballet at its best, bringing together world-class dance with enchanting family entertainment.